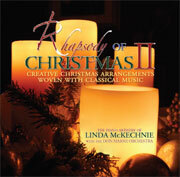 The artistry of Linda Mckechnie’s arrangements and piano stylings with the Don Marsh orchestra draws the listener to discover the familiar and the new. Experience Christmas with the unique combination of carols from around the world and classical music; the magical dance-like strains of Tchaikovsky’s Nutcracker woven with He is Born and Angels From the Realms of Glory; the lullaby of Away in a Manger with the haunting, compelling melody of Satie’s Gymnopedic#1; the high spirited Here We Come A-Caroling; the expressive solo piano of Sweet Little Jesus Boy; Linda’s introspective, original melody of Enjoying the Moment; and the syncopated surprises in Simple Gifts. 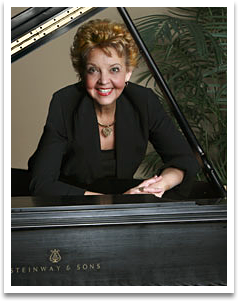 Linda’s musical sensitivity brings an ambiance of passion, joy, and reflection. For other options in performing these piano arrangements, review the categories under "published music"- to include CD tracks, orchestrations, and other instruments such as organ, treble instruments, and handbells.